A child narrowly escaped being hit by a car driving the wrong direction in Lurgan this morning. Corey, aged two, was grabbed quickly by his mum Linda McAlinden as a car turned left at the top of William Street into North St illegally. Linda said they had been having a bite to eat in Cafolla’s before heading to the butcher’s in North Street. The pair had successfully crossed from Market St to the island half way across North Street and awaited the ‘Green Man’. “I am trying to teach Corey about the Green Man,” said Linda. Single mum Linda, whose older son Riley has Downs Syndrome, said Corey is a great walker. It was about 11.40am and, as the Green Man came on, the pair were about to step onto the road to get across to the other side of North Street when a car drove from William Street across their path. Luckily the two-year-old and his mum are both OK. However Linda is badly shaken and upset that the car, which was being driving by an older man, had nearly caused an accident in the first place. “It was very frightening. Don’t people realise how dangerous that is. There is a sign clearly stating not to turn left. 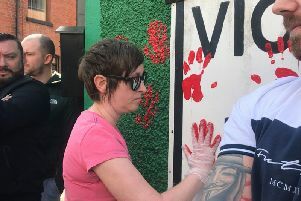 We are just lucky no one was hurt,” said Linda who plans to report the incident to the PSNI.